Until recently, I thought hay and straw were the same thing. Hayrides, barn floors, over-stuffed scarecrows and cows munching on grass – that’s what I knew growing up in Maine. I went to the Scarborough Fair and checked out the 4-H animals but never payed attention to the stuff. Now I know the basics and it seems so obvious that “Hay IS for Horses”. These fun facts and images should permanently clear things up if you’re still on the fence about which is which and what is for what. I’m mulching with straw in my garden and figured I’d show you what I learned. Straw is a by-product of the grain harvest, e.g., wheat, oats and barley. Straw is yellow or golden in color – think straw hats and baskets. The hollow stalks leftover after threshing are dried, then cut and formed into bales. Bales of straw have very little moisture content. 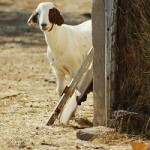 There isn’t much nutritional value in dry straw, therefore it’s not usually fed to livestock. Because it’s light and fluffy, it makes a nice bedding for animals. Straw can mulch your plants and keep the soil moist, keeping the top layer from drying out. It can also suppress weeds and it will compost naturally into your garden over time. Did you know straw is used as an ingredient in biofuels, packaging materials and paper manufacturing? Get a load of this: Straw bales can support and insulate a house. 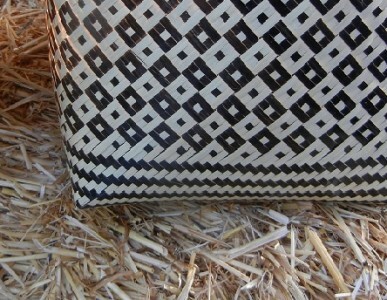 Green home manufacturers are now constructing straw bale homes! ~ Some folks, determined to cut down on weeds, put a few layers of newspaper down before adding the straw. This works well when you plant in rows. ~ Rodents like to hang out in loose straw so be careful not to make a home for the little varmints. ~ Straw is considered an organic mulch along with grass clippings, pine needles and shredded compost, leaves and wood products. 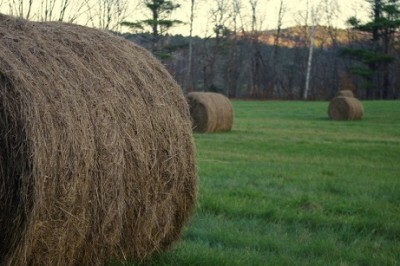 Hay is legumes such as alfalfa and clover or grasses such as timothy, oat, fescue and bermuda. Most of the time, seeds are still intact in a hay bale. Hay is green, especially when seen next to the more golden hue of straw. Plants are harvested when alive and usually cut before the seed matures, then dried. Hay bales sometimes have too much moisture content on the inside and can mold (bad for animals) or even burst into flames because heat increases on the inside due to the decomposition process. 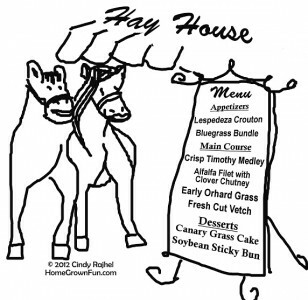 There are many types of hay used to feed livestock. Some contain more protein and carbohydrates to fuel hard working horses. 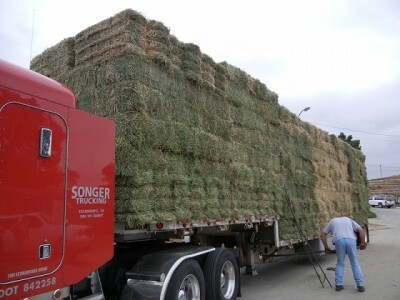 Specific types of hay are fed to animals depending on their nutritional needs. 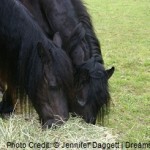 Horses, cows, sheep, goats and other animals eat hay especially when fresh pasture is not available due to seasonal or access limitations. ONLY USE HAY GROWN WITHOUT CHEMICALS. All straw is not the same. I’ve purchased bales of straw to mulch my garden that the feed store said would have little to no seeds and that is GOOD. Unfortunately, I have also purchased bales of straw that were full of seeds. 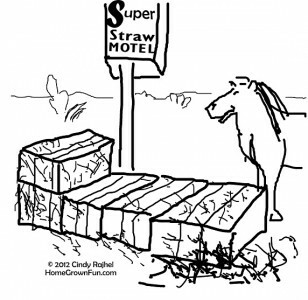 You do not want the straw to sprout in your garden beds. Once it takes hold of your soil it is hard to pull out, and time consuming. Avoid that problem. 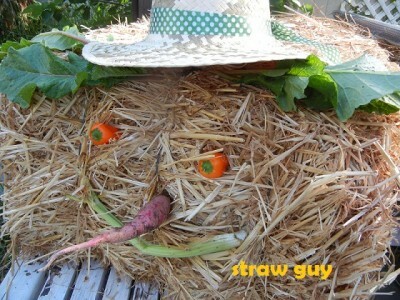 If you find you have loads of seeds in your STRAW place newspaper under the straw before using it as a mulch. The ideal method would be to make sure you are getting straw that has had the seed ends removed. Many times, dried hay is sold as straw. How can you keep from becoming a grain farmer against your will? Inspect the bale of straw carefully and do not buy it if you see seed heads. Also ask if that straw could have pesticide residue on it. Learn why this is so important here. A chemical-free garden is a well-balanced garden where pests are controlled by natural predators and natural predators don’t have a chance if you add materials to your garden that kill them!